Published November 14, 2018 By Anna T. This post may contain affiliate links. Regardless, I only recommend sites I've researched and/or used and trust. Scribbr is a Netherlands based academic editing and proofreading company with an international scope, offering their services in up to 10 different languages. Editors are available 365 days a year, and are able to meet fairly strict deadlines. Their rates are competitive, and their online interface makes the whole process of submitting work to be edited simple and convenient. Scribbr editors are mostly work from home employees, and they seem to be hiring most of the time, so we thought we'd do a quick overview of their editing jobs to see if the opportunity is interesting enough to be worth your time. Most of your Scribbr work will involve cleaning up the writing on various academic papers. Students can submit everything from their thesis or dissertation to small essays. Editors are expected to improve these papers in various ways, from basic sentence level fixes and minor enhancements to providing high level suggestions about the way information is organized. Edits are performed in Microsoft Word, with track changes enabled so students can see all the work you've done and decide which edits to keep or reject. With Scribbr, you'll generally be trying to meet specific deadlines. Students can select the due date when they submit their work. The longest deadline available seems to be seven days, and the shortest deadline is one day. Since the company focuses on academic writing, editors need to be very well versed in the intricacies of the academic style. There's a certain formality expected and all sorts of little rules you'll need to keep in mind. It will also help to know a little something about the subjects of the papers you edit. You'll be offered editing jobs via email based on preferences you choose in your profile on the website, including which fields of study you find most interesting and the sorts of deadlines you're comfortable with. You get to select among the offered jobs and decide which ones you want to handle, but from reading between the lines, it sounds like rejecting orders too frequently might be frowned upon slightly. Related: FREE e-course to learn about getting started proofreading transcripts for court reporters on your iPad. The number of orders you receive is partially based on an availability setting you can select on the site. Choosing a higher availability setting is sort of like promising to do more work, and breaking promises isn't likely to make your bosses happy. You'll also be automatically assigned with orders from returning customers who've worked with you before, and if you're refusing to provide editing for students who are clearly pleased with your performance, that might not do much for your reputation with the company. It sounds like most of the work involves taking English language papers written by non-English speakers and fixing them up to sound smooth. That means you'll have to do some pretty heavy lifting in some cases, so keep that in mind. According to their website, Scribbr pays about $23 to $25 per hour on average. The pay is actually a flat per word rate, but each job has a different number, depending on various factors such as assignment types, specific editing tasks, and deadlines. According to some current and former workers, the actual pay rate is often much lower than what the website lists because many papers are submitted by non-native speakers, and nearly every sentence needs editing. But some people are much faster editors than others, so it will vary. The website says you can set your own schedule. They also have an availability toggle that you can use to let them know how many assignments to send you. Scribbr will expect a minimum of at least 10 hours a week of work from you, and they put a special emphasis on availability during their busiest period, which is apparently from May to August. 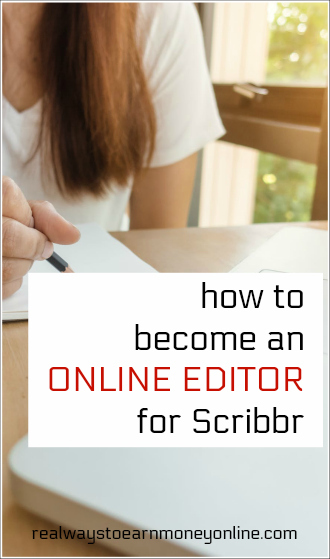 Scribbr offers a number of different editing jobs, with varying requirements depending on the language. For the English language jobs, in addition to being a native English speaker, you'll need a bachelor's degree and some experience editing academic texts. From glancing, it sounds like the “experience” of editing your own assignments while you were in college would probably suffice, but it's hard to be sure. You'll need a computer with a reliable internet connection, and access to Microsoft Word 2010 or later. To get started, go to Scribbr website and take the language quiz, which requires about 30 minutes of free time. Then you'll get a 3-hour test assignment. If you perform well on that, you'll be invited to “Scribbr Academy” where you learn all their rules and guidelines. The short training course sounds like it's fairly in-depth and will take about 4-hours to complete. Following training, you'll go through a trial period where you have to edit several articles while being carefully scrutinized to make sure your work is high quality. I used Glassdoor to look for Scribbr employee reviews. As of this writing, the overall rating is 4.3 stars, which is fairly high, and the comments generally reflect that. Most people seem to enjoy working for this company. It sounds like a fairly straightforward job with decent pay and plenty of work available. The most common complaints I saw were in relation to the huge variance in difficulty between assignments, which can cut pretty significantly into the hourly pay. Occasionally, you'll get a paper that's fairly pristine where you'll only have to make a few tweaks, but more often than not you'll be dealing with non-native English speakers who aren't very familiar with how English speakers put words together. This means you may occasionally have to reword whole paragraphs. If you have decent editing chops, and you want to work for Scribbr, go here to find a list of all the jobs available and select your native language to start the application process. Working for yourself is usually the most profitable route to take because you can set your own rates and seek out higher-paying clients. If you'd like some guidance in doing this, I recommend this FREE court transcript proofreading 7-day e-course – Learn how to proofread court transcripts from your iPad. Caitlin Pyle actually earned over $40,000 in one year doing this from home!